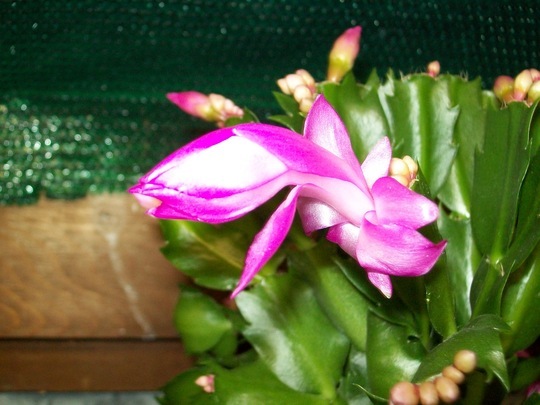 Just finished uploading some photos of the Christmas Cactus and Cyclamen that i took down to the 3rd greenhouse. I hope they will do better in there. 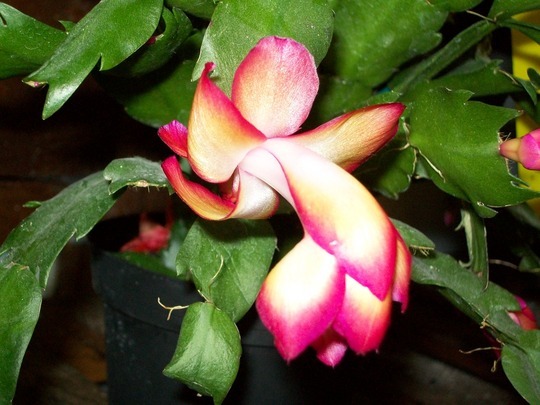 Some of the leaves were turning yellow on the Cyclamen, and there were bits dropping off one of the Christmas Cactus plants. They were not far from the window in the Kitchen, and i think it might have been too cold there for them. Now they are in the 3rd greenhouse there is temperature control, it shouldn’t drop below 50F (although i think it does slightly in very cold weather). It always feels warmer in there when i walk in. 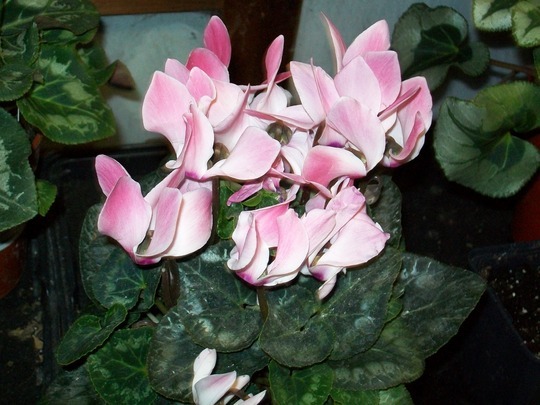 These were the Cyclamen i had from Dobbies, Percy Throwers and one from Homebase, that i moved into the greenhouse. 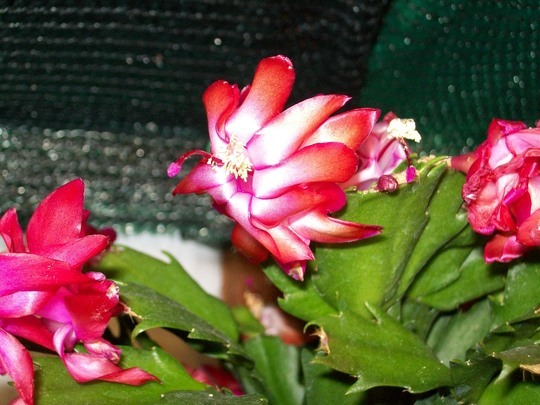 Some of the Christmas Cactus that i moved into the greenhouse at the same time. 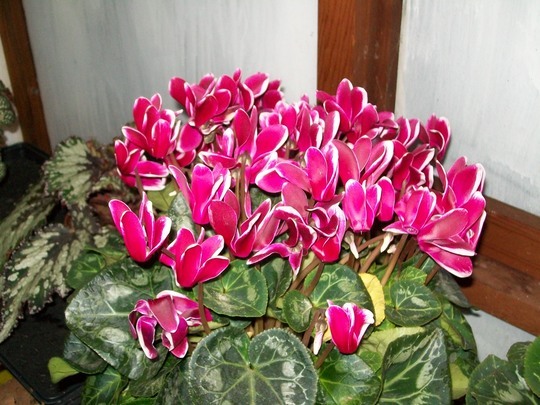 Never grown Cyclamen before. They do look nice plants. Don’t know if i can take cuttings off them? I might have a go, after they have finished flowering. I thought it would be nice to have a few plants that flower when my main plants have gone down for the winter, i will see how i get on with them. I often have a walk round Dobbies garden centre, while i’m there i always look out for any different Begonia Rex. They have some nice ones there sometimes, they are not named but seem to have been doing better than the plug plants i had from Dibleys. Last time i went to Dobbies a barrier was pulled down, so i went to the other entrance. There was a Dobbies staff member out in the car park, so i asked if they were open. He said they were but Father Christmas was there so they were very busy. I turned around and went round to Percy Throwers instead. Glad i did as i spotted a different Cyclamen from what i had last time i was at Dobbies. 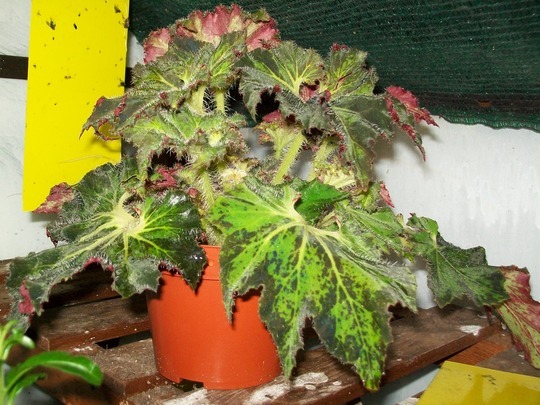 And a different Begonia Rex which i had. Over the last few months i have added a few different Begonia Rex from Dobbies, Percy Throwers and a few from ebay! Hope they all keep safe for you. Just love those Begonia, they are worth growing if its only for their splendid folliage. 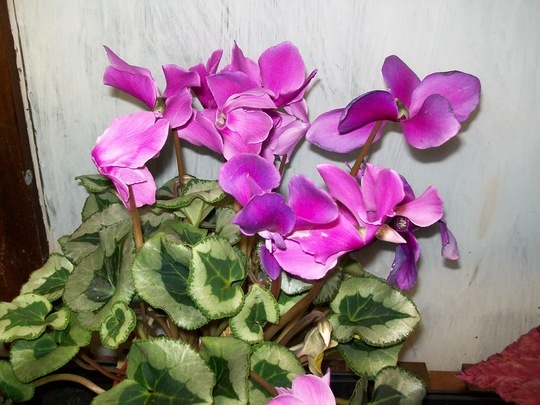 At least Cyclamen like cooler temperatures,they are lovely. 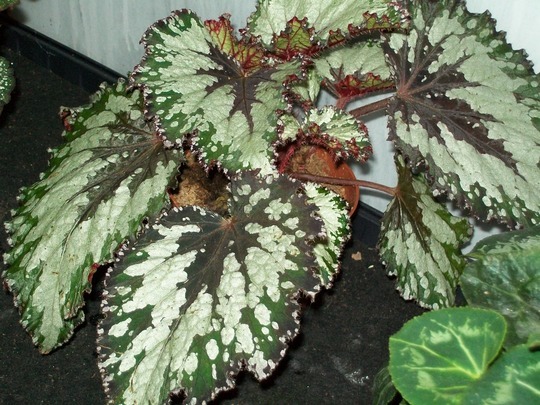 Hi Mark, I was given a cut leaf plantlet in the spring of the black Begonia NO.3 on your blog. 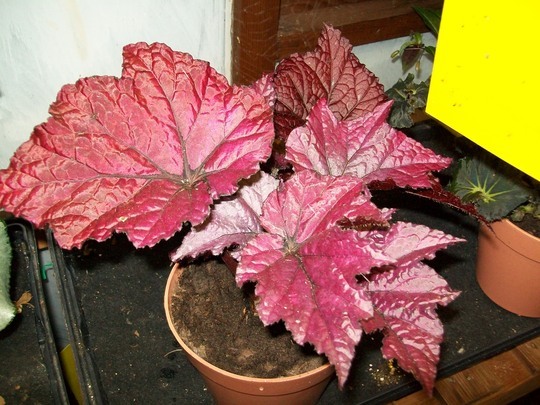 It has grown really big, but by friend didn't know the name of the Begonia. Do you? These Begonias are Begonia Rex, but I don't know the name of the variety of these. They might not be named varieties? None of the plants in these pictures had names with them when i purchased them. 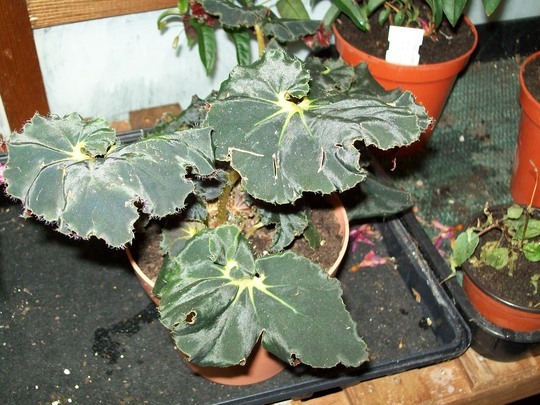 (these are all fairly recent aditions to my collection of Begonia Rex). The first 3 on here are cuttings from ebay, the 4th is from Percy Throwers and the 5th from Dobbies. 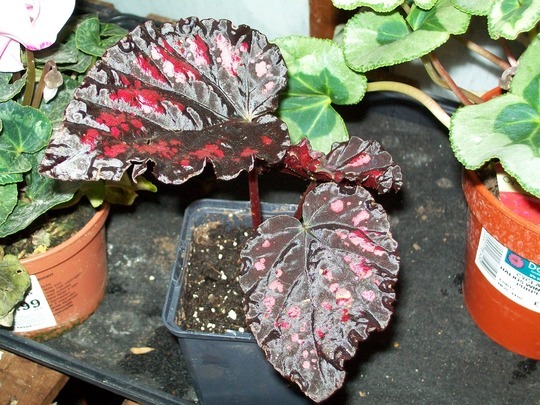 I have more Begonia Rex without names now than i have with names. The named plug plants i had been getting from Dibleys seemed to struggle, and i lost more than i got going. When i started getting the Rex from local garden centres they seemed to do better, but they never seem to have names, unfortunately. I like your Begonia Rex plants but I'm not sure if I have ever grown any. Though having said that the very first picture looks very much like a plant I had in Spain. I certainly haven't grown any others. 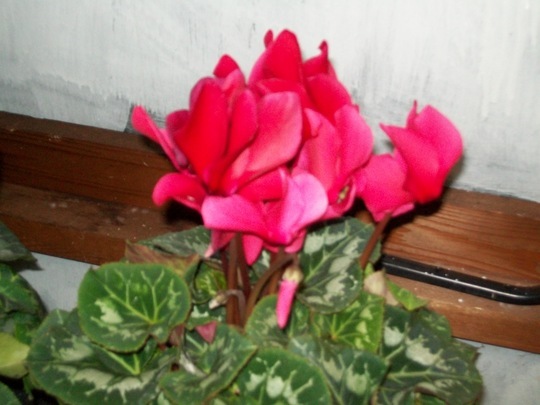 I have had a few Cyclamen on my balcony & living room. I had one mini Cyclamen that I'd had for at least two years on the balcony & even survived out on the balcony railings all last winter. It was growing there till I emptied the trough a few weeks ago to change the soil. I have no idea what I did with it. I had intended to plant it back in the same through. 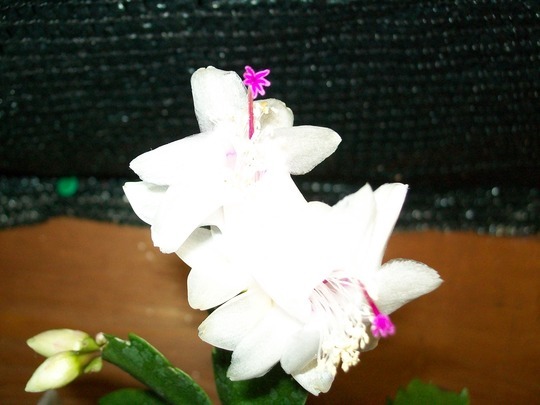 I have two plants of Christmas Cactus flowering on our living room table. They are a bright cerise pink! Lovely! :-)) I uploaded a couple of pictures to my garden.